If you are someone who spent a good part of their childhood during or prior to the nineties in India, you most likely spent all your free time, cycling around the neighborhood on a rented bicycle, reading Archies Comics, playing with Barbie dolls, jumping over compound walls or climbing trees. But that was a different time and you no more are that simple, oblivious little child of the nineties. Globalisation has hit the globe (tongue in cheek!) and the internet has taken it by storm. For every tiny question that erupts in your mind, there is a quick answer at your fingertips. People are virtually closer to each other now, then they have ever been and terabytes of information is shared on the word wide web every second. Bloggers, YouTubers, freelance writers, companies and the social media all sharing mammoth quantities of information about themselves, their homelands, their culture and their food. Food that was unheard of until ten years ago is now mass produced/ imported in bulk and made available to you at a nearby supermarket. One such fruit available to the New Word is the Avocado. "Having more nutrition than any other fruit in the New World, it is considered to be the most important contribution to human diet. Avocados have the highest energy value of any fruit. It also is rich in proteins and fat, and yet low in carbohydrates. Holding many valuable vitamins and minerals, the avocado is the fruit of promise in India." The Avocado tree is native to Mexico and Central America are are used as a base ingredient in many recipes originating from these countries. Guacamole is an avocado-based dip or salad first created by the Aztecs in what is now Mexico. In addition to its use in modern Mexican cuisine it has also become part of American cuisine as a dip, condiment and salad ingredient. 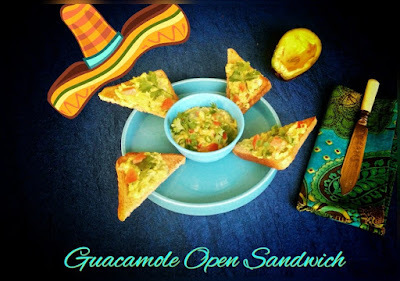 I absolutely love this dip/ spread as its easy to whip up and very healthy to snack on. 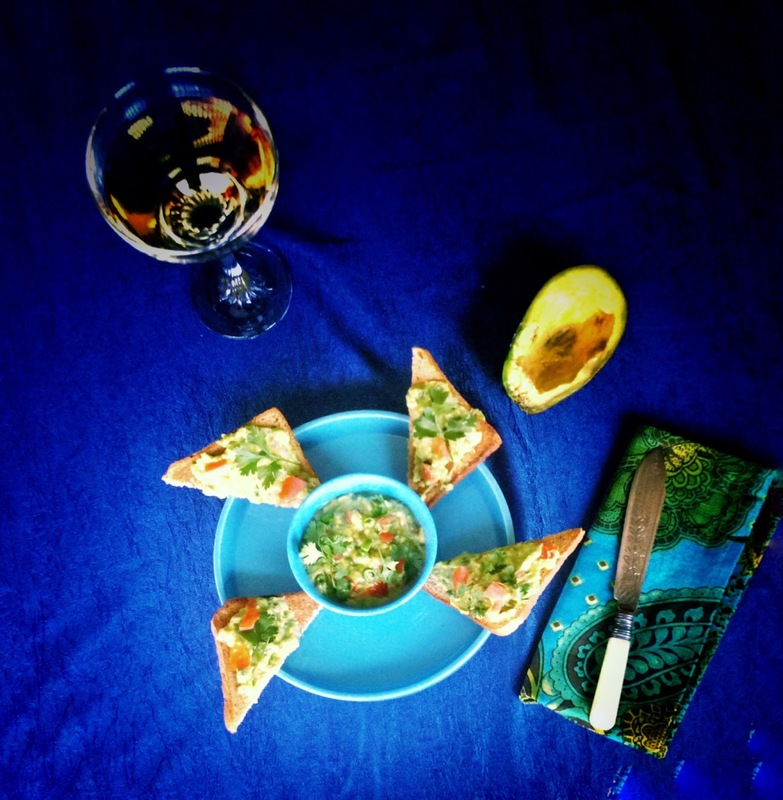 The avocado with its mild coconut like flavour, buttery texture and the tang from fresh limes are a great combination. 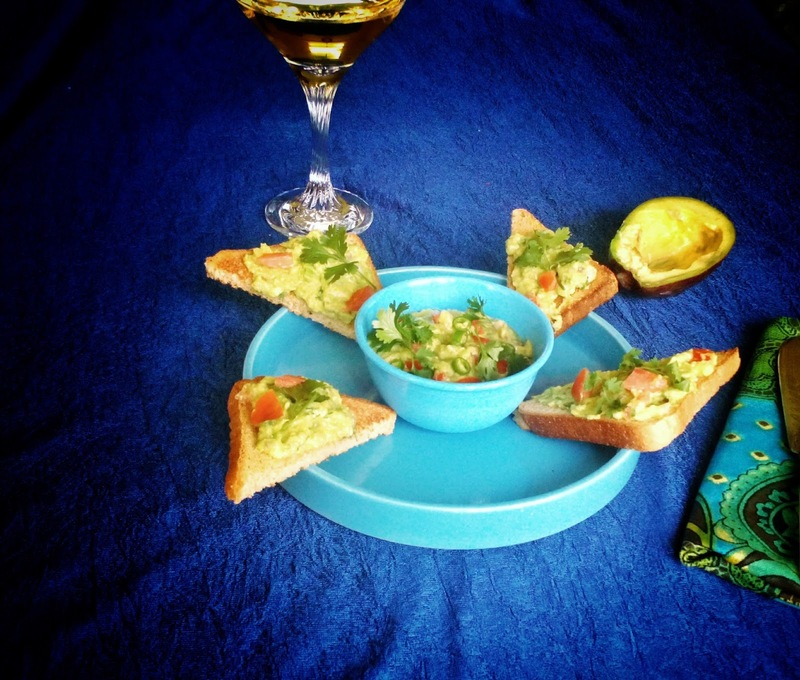 Today I'm sharing an easy guacamole recipe which I've used as a spread on an open sandwich. Perfect for those 5 pm hunger pangs, a quick fix when you have guests over or as a starter at your next weekend party! - Cut the bread slices diagonally to yield 6 triangles. >Cut a ripe avocado lengthwise and discard the seed. >Scoop out the flesh with a spoon into a bowl and mash it with a fork. 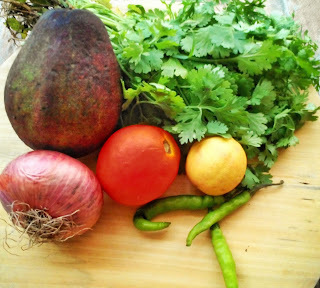 >Add in finely chopped tomato, onions, coriander and jalapeno pepper. >Add the lime juice and season with pepper powder, garlic powder and salt.